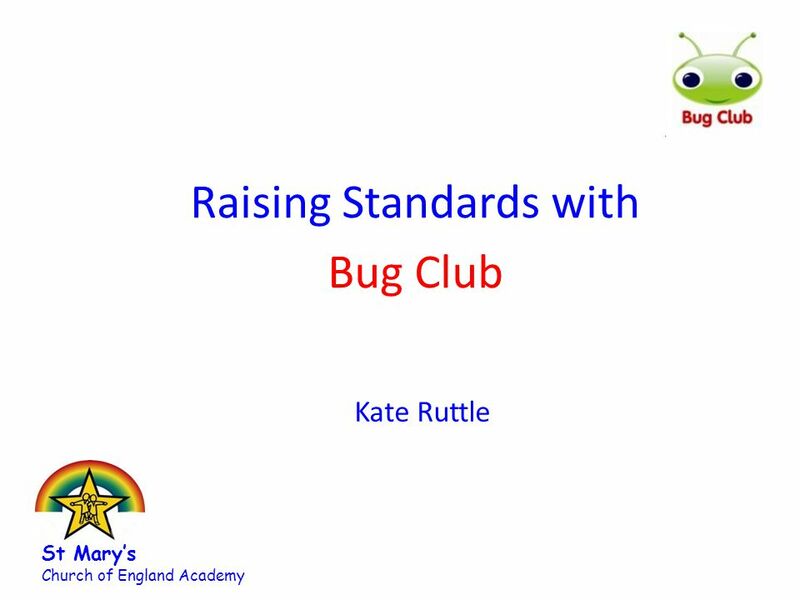 Raising Standards with Bug Club Kate Ruttle St Mary’s Church of England Academy. 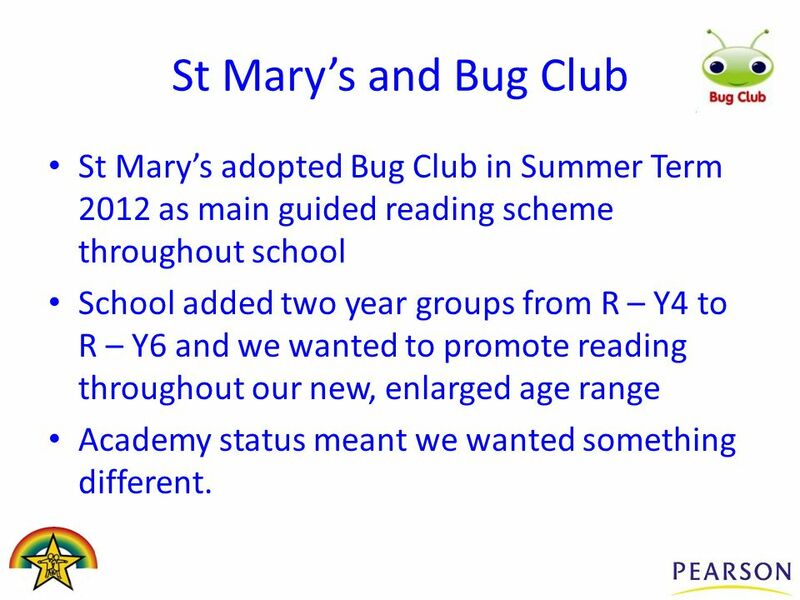 2 St Mary’s and Bug Club St Mary’s adopted Bug Club in Summer Term 2012 as main guided reading scheme throughout school School added two year groups from R – Y4 to R – Y6 and we wanted to promote reading throughout our new, enlarged age range Academy status meant we wanted something different. 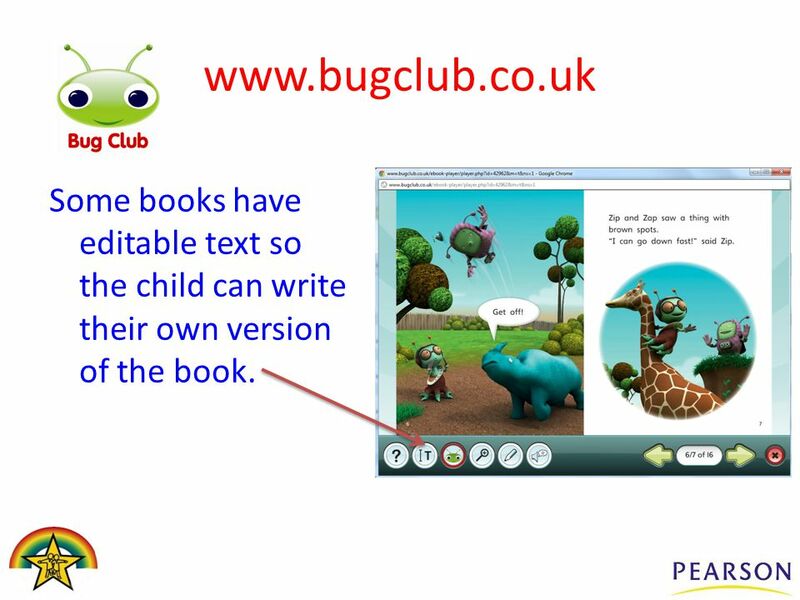 3 200+ new titles commissioned since the introduction of synthetic phonics. 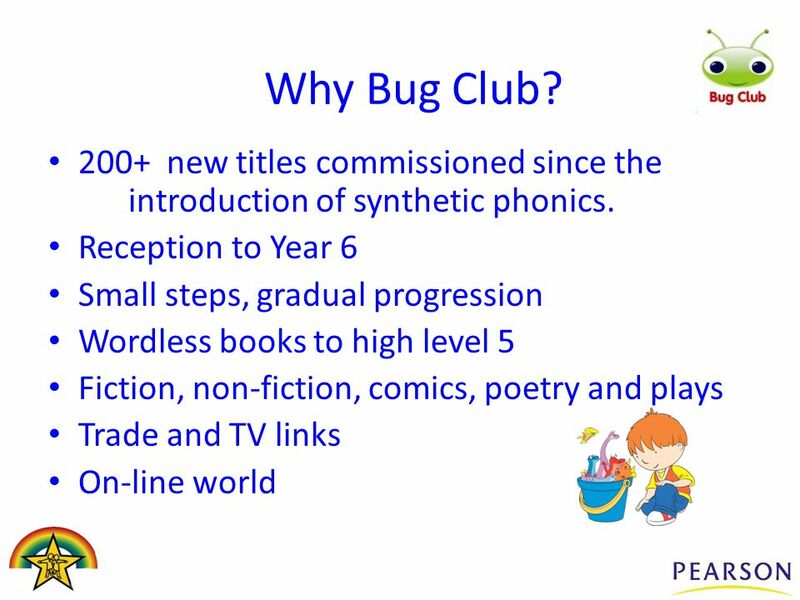 Reception to Year 6 Small steps, gradual progression Wordless books to high level 5 Fiction, non-fiction, comics, poetry and plays Trade and TV links On-line world Why Bug Club? 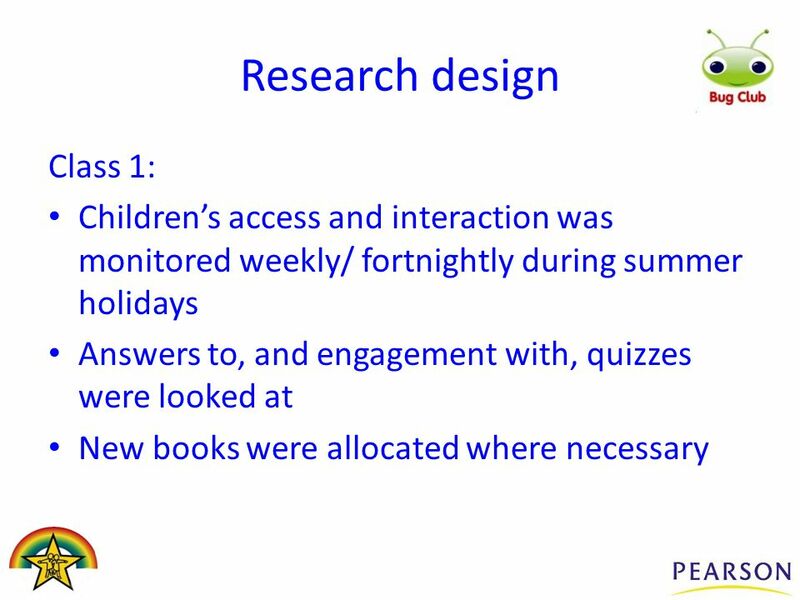 5 Research Question Does having access to e-reading books for the summer holidays ~ limit the Y3 dip? 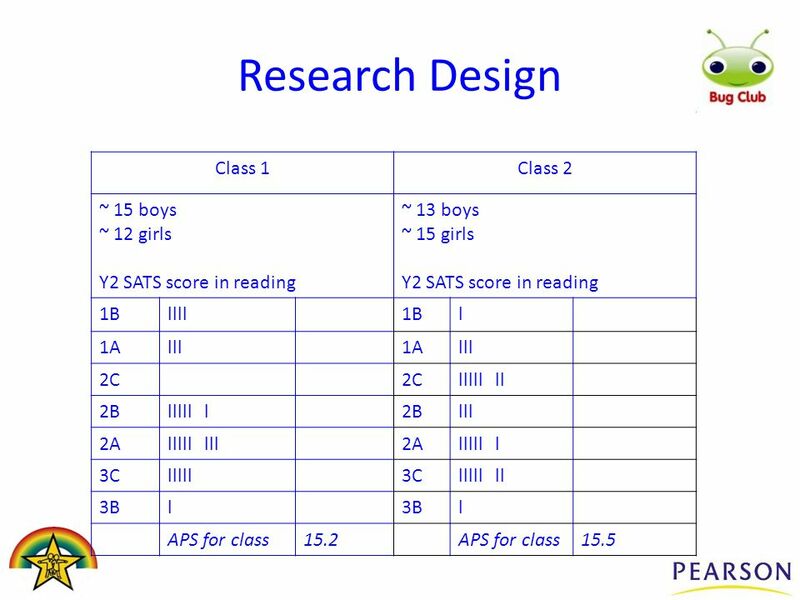 ~ impact on standards? 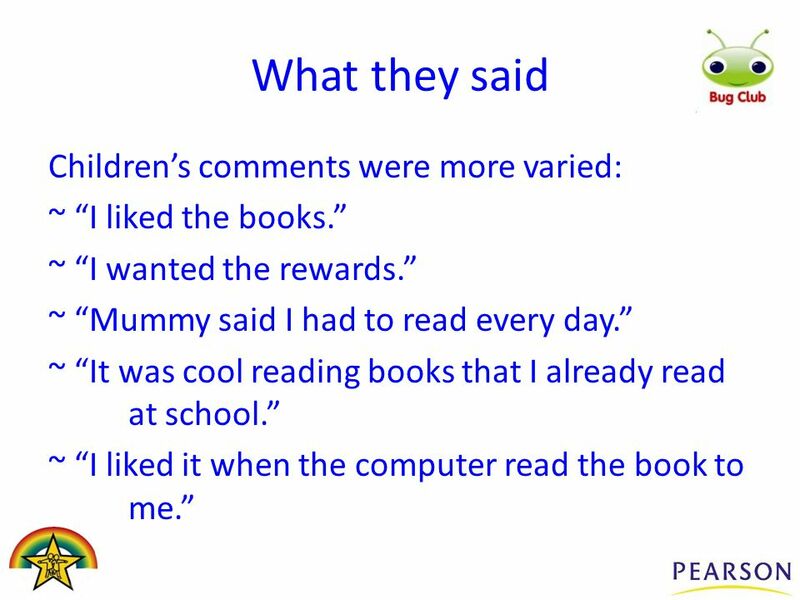 ~ mean that children read more during the summer? 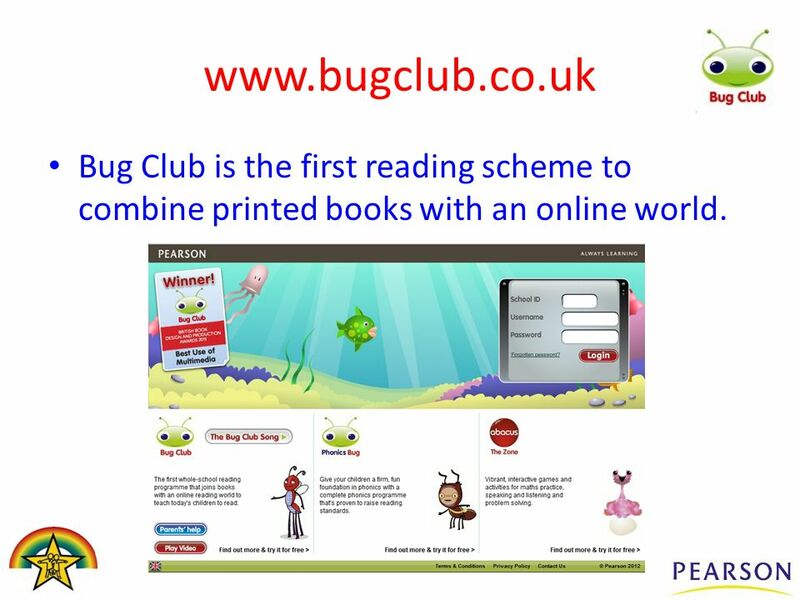 8 www.bugclub.co.uk Bug Club is the first reading scheme to combine printed books with an online world. 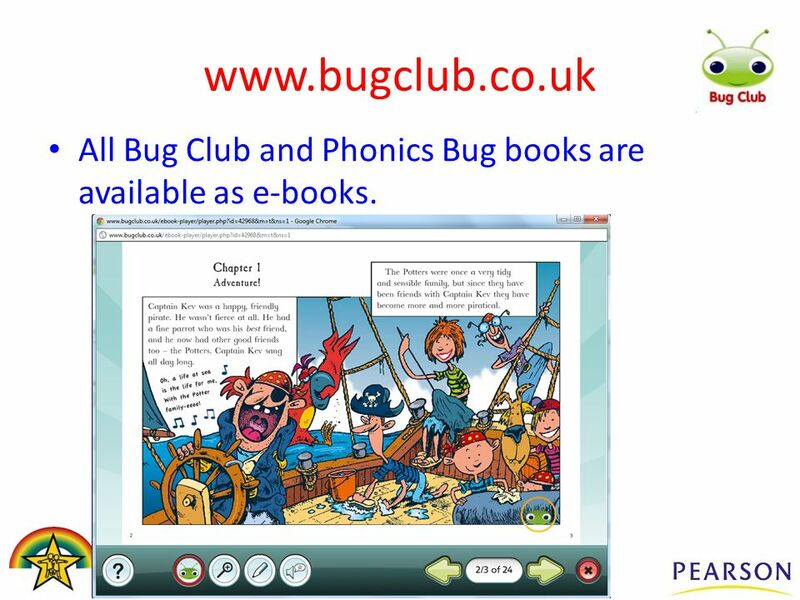 9 www.bugclub.co.uk All Bug Club and Phonics Bug books are available as e-books. 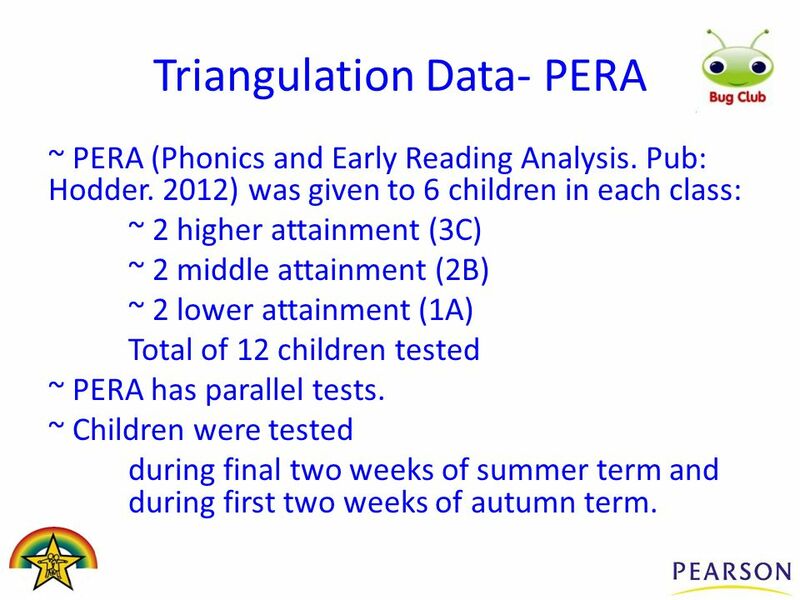 25 Triangulation Data- PERA ~ PERA (Phonics and Early Reading Analysis. Pub: Hodder. 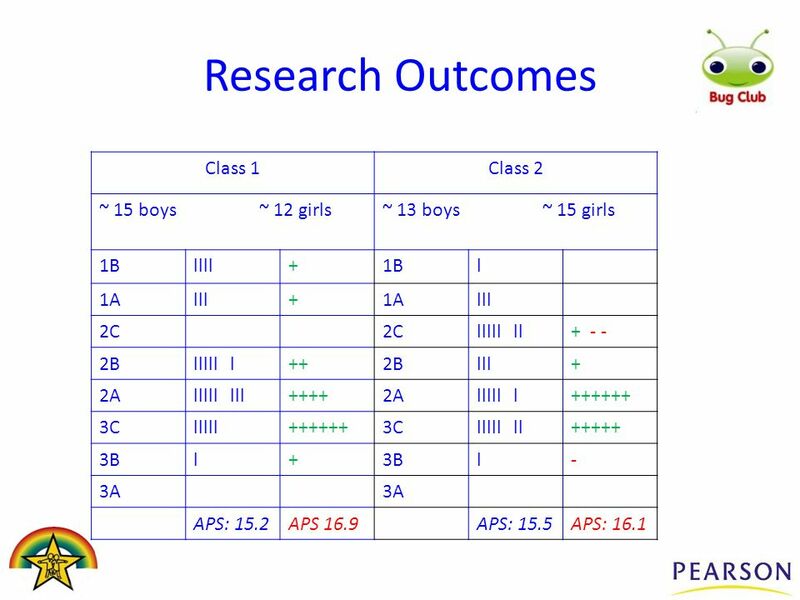 2012) was given to 6 children in each class: ~ 2 higher attainment (3C) ~ 2 middle attainment (2B) ~ 2 lower attainment (1A) Total of 12 children tested ~ PERA has parallel tests. ~ Children were tested during final two weeks of summer term and during first two weeks of autumn term. 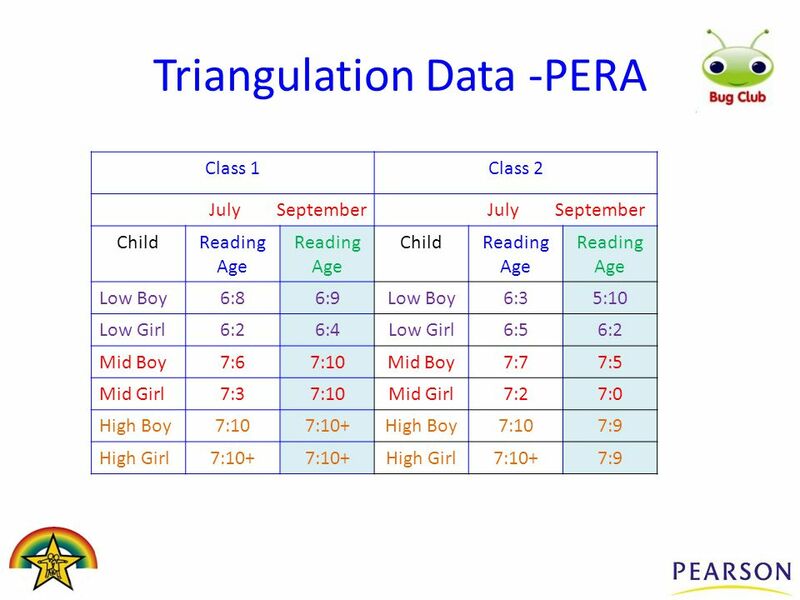 27 Triangulation Data -PERA All PERA children in class 2 experienced a ‘dip’ during the summer holidays -1 to -5 months No PERA children in class 1 experienced a ‘dip’ All PERA children in class 1 accessed Bug Club at least once a week These increases did not all equate to improved levels (4/6 gained a sub-level) but there were no dips. 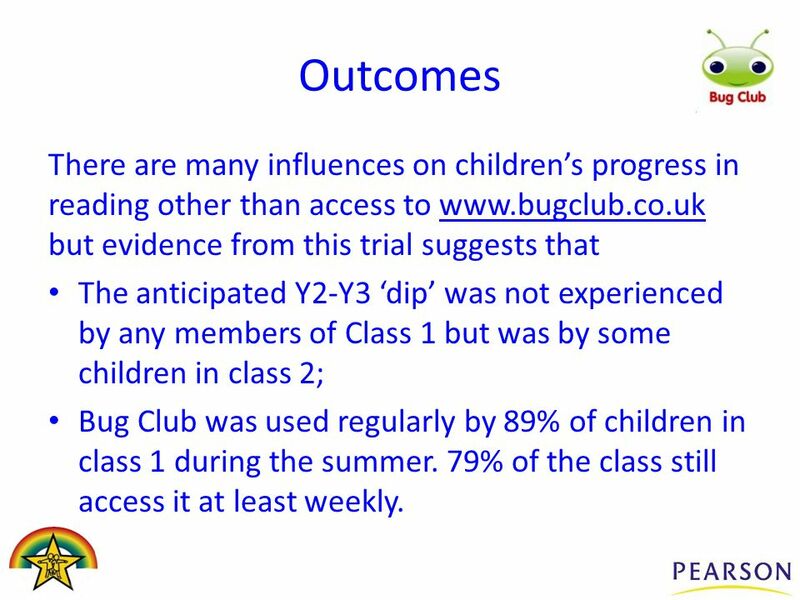 33 Outcomes There are many influences on children’s progress in reading other than access to www.bugclub.co.uk but evidence from this trial suggests thatwww.bugclub.co.uk The anticipated Y2-Y3 ‘dip’ was not experienced by any members of Class 1 but was by some children in class 2; Bug Club was used regularly by 89% of children in class 1 during the summer. 79% of the class still access it at least weekly. 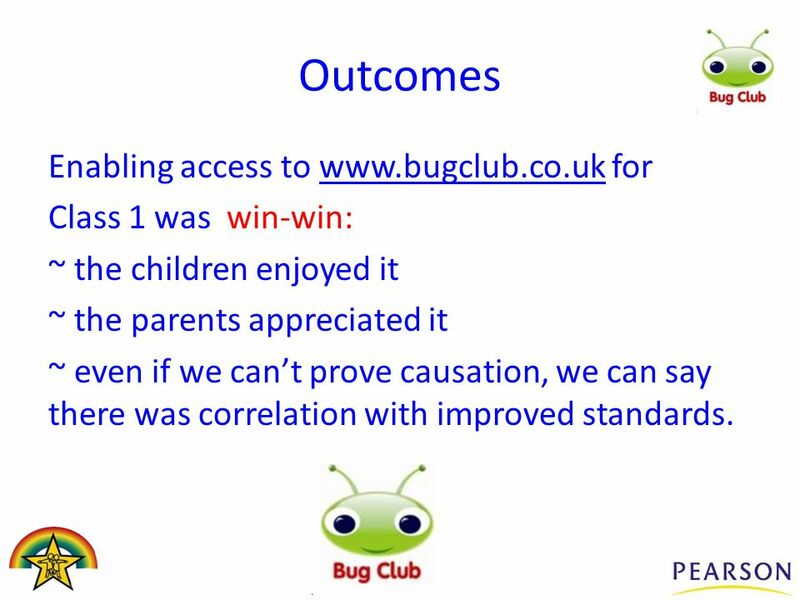 35 Outcomes Enabling access to www.bugclub.co.uk forwww.bugclub.co.uk Class 1 was win-win: ~ the children enjoyed it ~ the parents appreciated it ~ even if we can’t prove causation, we can say there was correlation with improved standards. 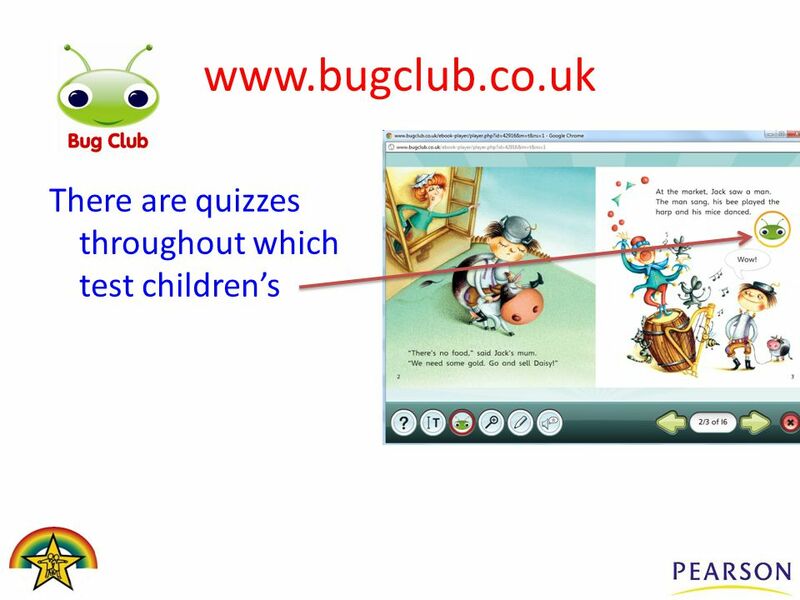 Download ppt "Raising Standards with Bug Club Kate Ruttle St Mary’s Church of England Academy." 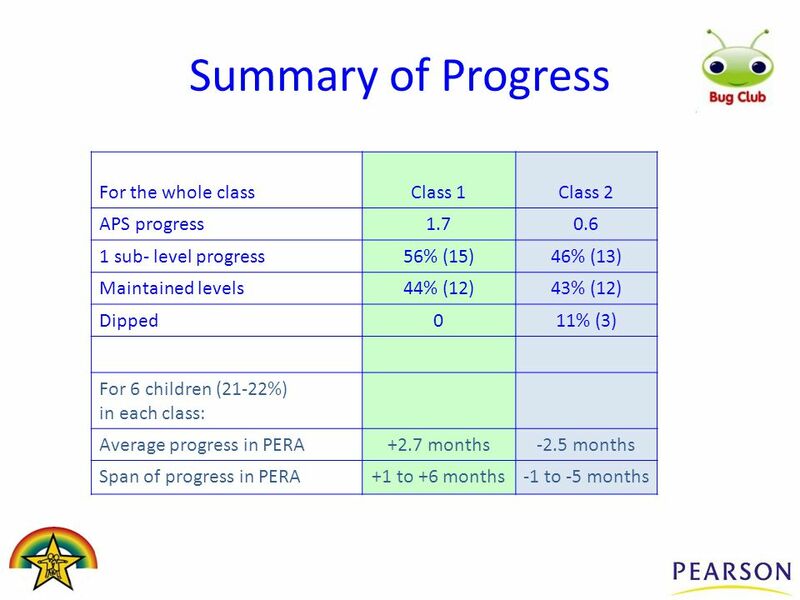 Assessment and Tracking Evening Foundation Stage 2 & Key Stage 1. Moderation Workshop for Y2 and Y3 Teachers Karen Samples. 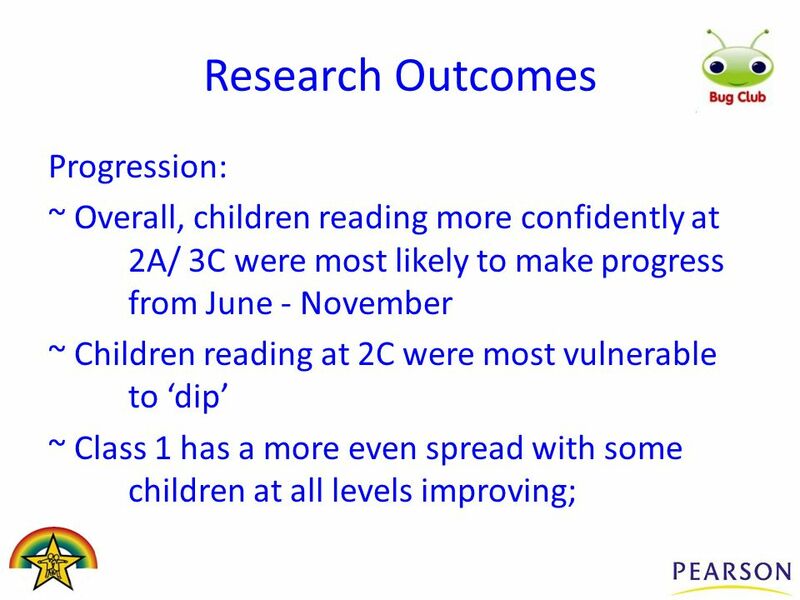 PHONICS AND EARLY READING WORKSHOP FOR YEAR 1 AND YEAR 2. Reading at The Horsell Village School Autumn 2013. Reading at St Joseph’s. Aims of today To explain how we teach reading. To introduce Read, Write, Inc. Sample ‘Speed sound’ session. To share some practical. 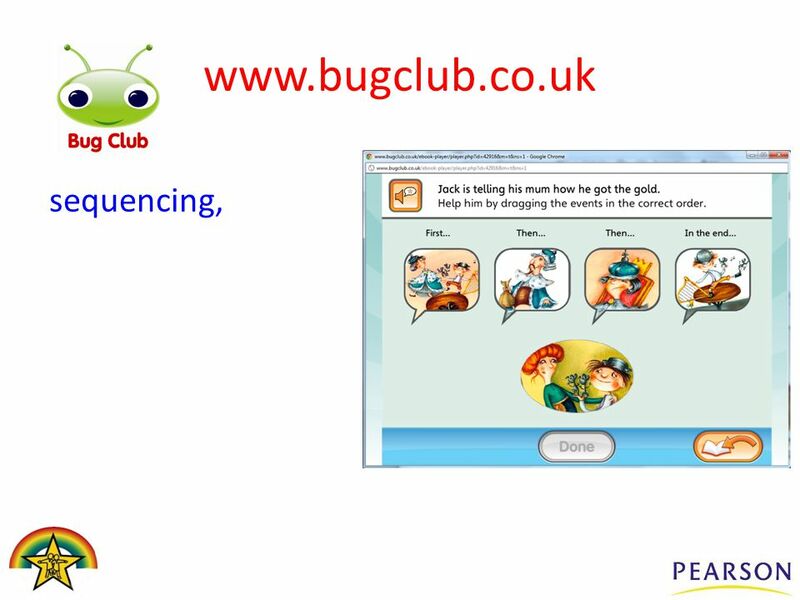 English: The New Curriculum & Bug Club Wednesday 13 th May 2015. 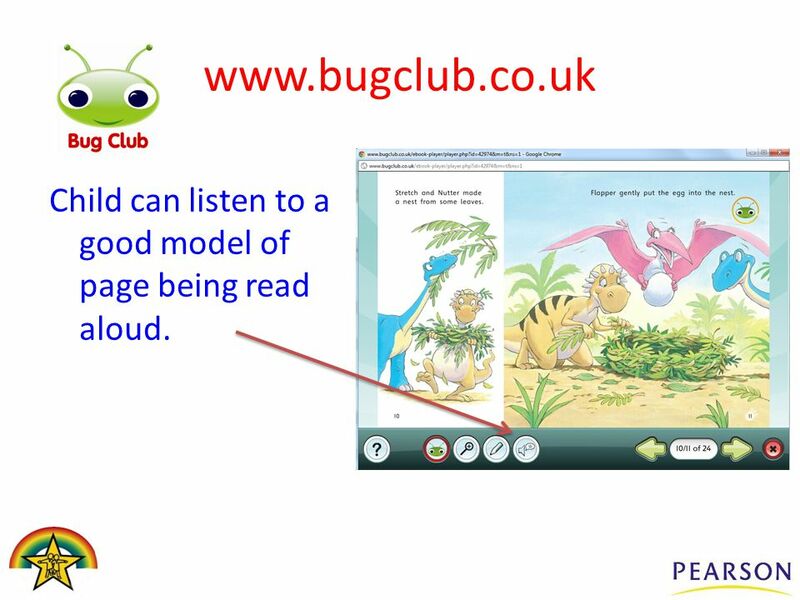 Bug Club Online Reading Resource. 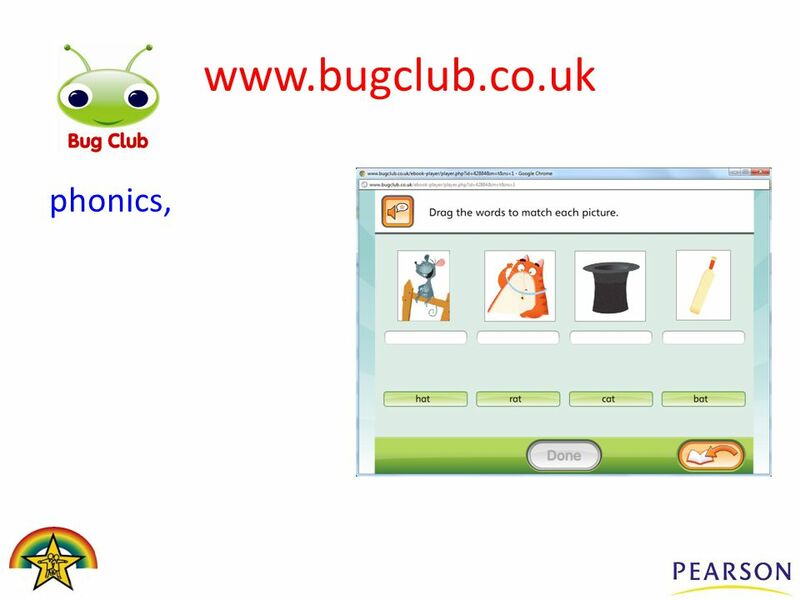 Introduction to Bug Club How does it work? Opportunity to navigate the website in classrooms Questions with class teachers. Middleton Parish Church School Reading Meeting Welcome. Summer Reading Challenge Last year, 690,000 children in UK took part in Team Read ,200 children (58%) read 6 or more books 2.8 million library. Whenever you read a good book, somewhere in the world a door opens to allow in more light. Vera Nazarian. Improvements and Progress Meeting for Parents: Tuesday May 13 th 6 pm. Reading... And anything else we’d like to know about! 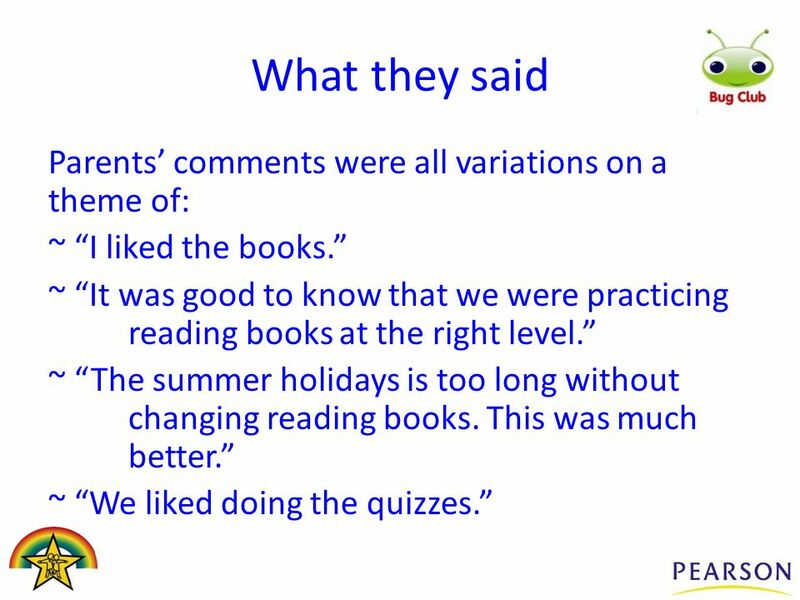 The effective use of tests and tasks to support teacher assessment in Y2 4 th February 2014 Karen Samples. Reading Reading and Phonics in the Foundation Stage. Year 1 Phonics Check A Guide for Parents May 2016.